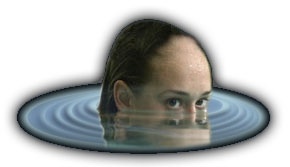 The initial inspiration that spurred an investigation into water imagery and the relationships between people and water occurred in the autumn of 2001 when it was learned that the Montgomery Gym swimming pool was to be demolished. In an attempt to document the architectural space and collect video for future use, several hours of footage were shot inside the pool area during the spring of 2002. This original idea took into consideration that the new Black Box Studio would be positioned in the exact location that the pool once occupied. With the use of the 360º curtain that was to be installed in the studio, a performance installation in the Black Box Studio was visualized that would recreate the sensation of being in the pool. The working title, Aqueous Myth, seemed appropriate for a dance work that would serve as allegory of a legendary aquatic space filled with memories of the past. Shortly after the project was underway, I was approached by Seven Days of Opening Nights and asked if Aqueous Myth might be considered as the pilot project for the festival’s new art and technology component. The Seven Days organization had intentions of applying for a technology-specific grant that would support the project. I was asked to brainstorm on how the project might be accomplished on a much larger scale than originally envisioned. Instantly, the scope of the project grew beyond my expectations. What had begun as a ripple in the local pool, had now potentially become a momentous tidal wave. In response to the support from Seven Days, I set out to devise an evening of multimedia dance theater that would compare in professionalism to other featured events of the festival. The outcome was an interdisciplinary process to include twenty-five creative artists and sixteen technical staff. The design of the project supported bringing in a number of artists to infuse the Tallahassee arts community with outside influences. This original design included the use of Internet2 for bringing in media sources and for broadcasting the live performance. A company of dancers would be hired and the project would include a touring element to bring visibility to FSU and the MANCC. With fluidity in mind, the resulting project design took into consideration the many benefits a project of this scope might have for the department, university, and Tallahassee community. Equipment purchases were to be geared toward long-term investments for the department, and the selection process for guest artists was to be determined with the input of faculty. With the Seven Days Challenge Grant process underway, the reality of facilities made it evident that a February 2004 premiere date was not realistic. The decision was made to withdraw the grant application and postpone the project for one year. Without the certainty of the Seven Days funding, an exercise in budget reduction seemed appropriate. The scope of the project was reconsidered and a scaled down proposal was created. In reconsidering the interdisciplinary nature of the project and the potentially limited funds for travel, national and international artists were reconceived as regional, local, and university personnel. As non-essential personnel were eliminated from the project plan, more responsibilities fell to the Artistic Director. My role in the project was expanded to include editing, projection design, musical composition, grant writing, choreography, and project administration. I find it very interesting that the project has gone through so many revisions, even before there is any public evidence that the project exists. This series of restructuring exercises has resulted in a much clearer vision of the project. With the obstacles of space and funding came the necessity to work creatively, improvising on new methods for bringing the vision to reality. The initial ripple that began in a swimming pool had, in quick succession, experienced a rushing tidal wave of support, a funding undertow, and a series of rising and receding opportunities for success. Adverse conditions for progress forced a deceleration in the pre-production phase. This “calm before the storm” has actually nurtured the creative process, allowing time for new ideas and additional research. With a project plan that has undergone numerous revisions, I feel positioned to move buoyantly onward navigating the rising tide. 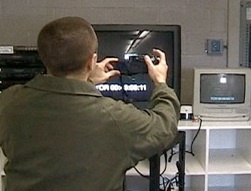 Media collection for projections began in 2001. Initially content was focused on the Montgomery Pool as an architectural space. As the project developed conceptually, the vision of how video source material would be used as projection broadened to reflect a more universal representation of water imagery. Keeping in mind that video is only one of the contributing elements intended to create gestalt, efforts were made to create an archive of subtle moving textures that could support the intent of fluidity. Over 60 hours of footage has been collected including waterfalls, rippling textures, rain, aquatic animals, nautical vessels, and many other images. Selections from this archive of source material will be integrated into the total theater design throughout the production. 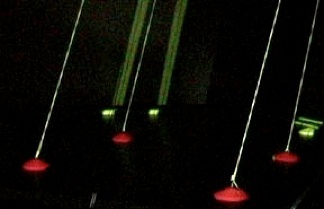 Isolated areas of the stage may be enhanced with the use of technology to provide kinetic environments in which to dance. Projection master DVDs will be custom designed for each section of the work utilizing a matting technique. The incorporation of graphic and video technologies allows the imagination to extend, making it possible to create unique performance spaces that fulfill the vision of creative explorations. The composing of a soundtrack for Aqueous Myth has involved a number of phases and approaches to the partnership between music and dance. Inspirational tracks were initially collected from a variety of sources to help envision musical accompaniment for sections as they conceptually evolved. From these found sources a rough dynamic graph was created as a roadmap for audio composition. Many of these early inspirational tracks have been replaced by original scores, created by different artists in the FSU Department of Dance Music Resource Center. The MRC, as it is known, is a music production facility offering industry standard audio production tools to project composers and collaborators for dance. Among these tools are a full recording studio, loop and sound effects libraries, and audio computers and software for digital sound editing, mastering, loop based composition, score writing, publishing and more. 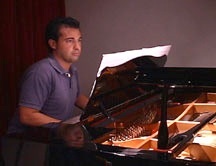 For example visiting Italian artist Giacomo Battarino composed and recorded Storm using the MRC's Yamaha C7 Concert Grand Piano and recording studio. Michael Strickland from the FSU School of Music and Jeffrey Rolf the director of the MRC collaborated utilizing most all of the studio's extensive resources. They recorded local area artists using the recording studios powerful Digidesign ProTools HD3 system; they composed using the realistic string sounds of the Garritan Orchestral Strings collection with Tascam's Giga studio 160 sampling software; and exploited the MRC's substantial collection of Sound Ideas sound effects Libraries and Sony loop libraries to produce Ice - the finale of Aqueous Myth. Collaboration with electro acoustic music specialist Dr. Mark Wingate of the FSU School of Music has led to the inclusion of spatial sound design as the dance theatre will be transformed into a surround sound environment. The audio experience will also include an interactive element as programmed sounds are randomly triggered as an aural layer along with composed scores. Original, inventive movement will be created to kinetically express a variety of human experiences related to interactions with water. The human body will communicate its story as a motional instrument utilizing dynamic energy, sculpted shaping, and spatial explorations. 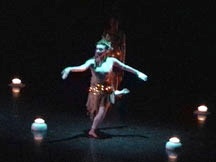 Anemones previewed at the Tallahassee Ballet Company's 2004 Evening of Music and Dance. Voyage, an original choreography inspired by Alwin Nikolais' 1953 Aqueoscape, sets the mood for a nautical journey as the opening dance in Aqueous Myth: Tales of a Water Planet. Murray Louis graciously worked with FSU dancers during a December 2004 residency at the Maggie Allesee National Center for Choreography. Louis recalled images from the original cast of Aqueoscape as created and performed in the Henry Street Settlement Playhouse in NYC. FSU Dance BFA graduate Lindsay Meeks explores movement vocabulary and responds to the mediated stage as she begins to shape the choreography for Clownfish. Meeks is working in collaboration with projection designer Tim Glenn on this section of the production. FSU Dance MFA Candidate Angela McDonough will appear three times throughout the evening to portray Goldie, a character study exploring the domestic uses of water. Choreographer Wallie Wolfgruber of SUNY-Brockport contributes her solo, Hatch, to the production.Guest Artist Beatrice Corbin will perform the solo, setting the mood for Waterbirds by FSU faculty member Rick McCullough. The first sketch of Jellyfish occurred at the University of Wisconsin–Madison during the Dance Millennium Summer Dance Camp in 2004. This section is being recreated using twenty-four FSU students, many from the General Studies Program in Dance. Nautiloids, by Professor Anthony Morgan, will be showcased within the revised Jellyfish, which will be broken into two sections. It became evident in the early stages of pre-production that a work of this magnitude requires a dedicated space for experiment. The newly renovated Montgomery Hall at FSU has provided a technologically-enhanced environment supporting such performance development. 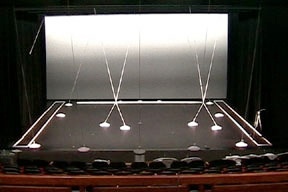 In early July 2004 the Nancy Smith Fichter Dance Theatre was made available for projection planning and set design. 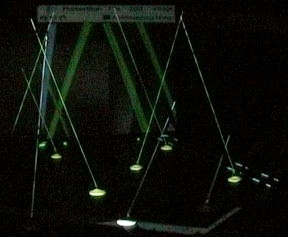 A six-week period during this summer was utilized to construct the stage environment and calculate the geometry of six projection sources. 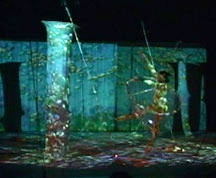 In August 2004 the Aqueous Myth set and technology were moved into the Black Box Studio for continued testing and rehearsals. 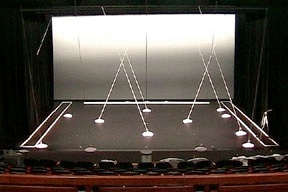 This space is to be used until May 2005 to simulate the theatre in which the premiere will occur in September 2005. 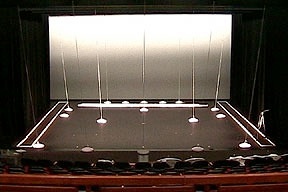 In May 2005 the set will once again be constructed in the Nancy Smith Fichter Dance Theatre where final testing will occur during an intensive summer session focused on the project. Six video sources will be synchronized, spatially and temporally, and projected from different angles into the performance space. Most video footage will be shot on miniDV format, edited in Final Cut Pro HD, burned onto DVD-Video disks. Two live-feed sources will be incorporated into the design of the work. These camera and projector duos will be positioned on the right and left sides of the stage, in full view by the audience. Projectionists will operate the two miniDV camcorders connected to InFocus projectors. Each of these set-ups is positioned on a 35’ tracking dolly that is free to roll upstage and downstage. 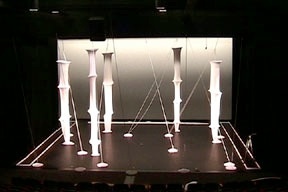 The set design will act as a stage for dance performance, as well as a dimensional projection environment for video. 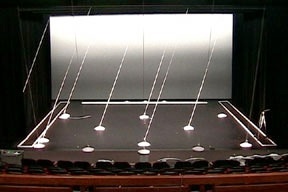 The concept for the stage results in a live, 3-D cinema effect where dancers seem to blur the boundaries between stage and screen. Variety and contrast are created through constant changes in relationships of screens and props. 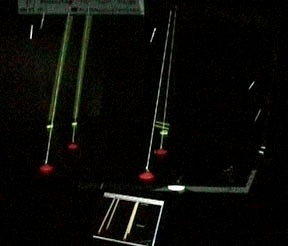 Illumination of the performance environment will contribute to the dimensional illusions created with video projections. Careful planning of angle, intensity, texture, and color will aid in the creation of mood. Experiments with reflections of light on water will lead to creative effects not commonly possible on the traditional stage. A delicate balance of light must be found, taking into consideration the additional lighting sources contributed by video projectors. The creation of shadows and silhouettes, in combination with projected images, will result in a complex mixture of illusions. 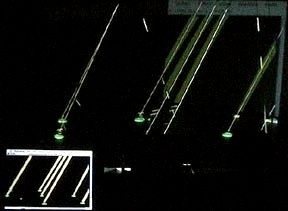 Once the production begins, four of the six projection sources must run in complete synchronization for approximately 78 minutes. Four master DVDs will be created once the 80 final video segments (20 segments X 4 projectors) have been edited. Each of these will play from identical DVD players, initiated with a single remote control. In order to ensure accuracy a number of tests have been conducted. 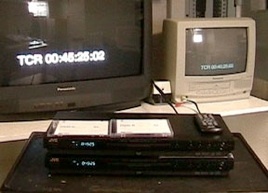 DVDs containing only timecode were created, then, simultaneously played from the DVD players. 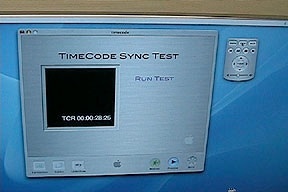 After playing for over one hour a digital photograph was taken of the monitors displaying the timecode as played from the DVDs. 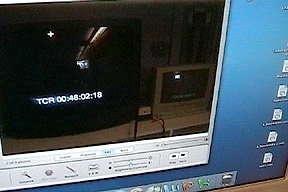 The timecode numbers of the monitors in the photo were compared to reveal an inaccuracy of only 1 frame, 1/29 of a second. Choices in textile and design will be influenced by the desire to achieve a cumulative effect of production elements. The critical selection of color palette must take into consideration the fine balance of lighting effects in relation to the limitations of projected technologies. Balancing color saturation, texture, and value is essential and necessitates experimentation and testing early in the creative process. The stage design results in a multi-layered, dimensional projection environment that constantly changes throughout the evening. A number of scrims and projection surfaces are utilized, resulting in enhanced depth and layering of images. 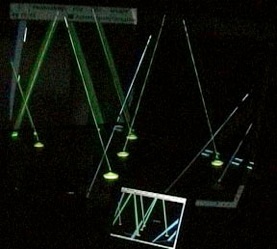 Calculating the angles of projection for these sources requires meticulous testing, but results in a 3-D canvas, on which to choreograph motion and light. Spatial mapping has been accomplished by pre-determining the position of projection sources for the actual performance, framing the stage areas to be illuminated, and documenting the plan for future recreation. This is a critical point in pre-production. Once these decisions have been made, all other design choices are based on this master plan. Thorough integration of the elements of production will result in a unified product producing accessibility and readability through the logical and justified assembly of components. Working toward a product in a manner often referred to as “total theater” a balance is created where movement, light, costume, set, sound, and projections result in a merger that rises above the artistic level of the rudimentary elements. Many collaborators will contribute to the success of a new work bringing together an impressive body of creative knowledge and experience. This infusion of cutting-edge artists will bring with it a number of cultural opportunities for our regional population. This model for collaboration reflects the changing nature of multidisciplinary creation and defines the use of technology as an equal partner in the creative process. These professional collaborators will act as role models for future artists, those that will further develop the art-making process with the new tools of their era.